If you are facing legal issues and are in need of an attorney, it is important to understand what type of attorney you need. If you are being accused of a crime or you are involved in a court litigation, do you know if you need a criminal defense attorney or a civil attorney? Most people don’t even realize there is a difference. Below are the key differences so you know what type of attorney you need to contact right from the start. Civil courts typically handle disputes that occur between businesses and people. These disputes include family issues including divorce and child custody, contract and business disputes, property disputes, and personal injury cases. In a civil dispute, the plaintiff files a claim against the defendant and asks the judge to award compensation or damages, a change in legal status, or other type of relief. These cases can be brought at a local, state, or federal level. Criminal courts start with a criminal prosecutor bringing charges against the defendant for breaking a law. This may be a felony or misdemeanor charge depending on how severe the crime was. In a criminal case, the victim of the crime will not have a say whether criminal charges will be brought against the defendant that broke the law. The prosecutor will have the job of deciding this if they believe they can prove beyond a reasonable doubt that the crime occurred. If a defendant is found guilty, they will be sentenced for their crime. This may include a fine, restitution to the victim, probation, or prison time. Criminal cases are offenses against the society or state and are filed by a representative of the state. Civil cases are crimes against an organization or individual and are filed by the party that has been wronged. Criminal cases may result in jail time for punishment, but civil cases cannot. Criminal cases have a strict burden of proof for the defendant to be found guilty (beyond a reasonable doubt), but civil cases have a much lower standard of proof (the preponderance of evidence). A judge or jury may decide a criminal or civil case. In a criminal case it is the defendant that determines if there will be a jury trial or judge. In a civil case it is the plaintiff that requests the jury trial, although some cases cannot be tried before a jury. A jury for a criminal case is made up of 12 people and a civil jury is comprised of six people. Defendants accused of a crime are entitled by the constitution to have a defense attorney even if they can’t afford one. The state is required to provide an offender. The defendant in a civil claim must supply and pay for their own attorney or defend themselves. Defendants in a criminal case are offered multiple constitutional protections such as protection against illegal searches. These same protections are not offered to civil defendants. The attorneys at The Law Office of Hammad S. Matin, P.A. offer both criminal and civil representation. 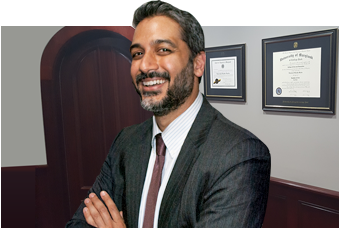 If you are facing criminal charges or need an experienced Maryland attorney to represent your interest in a civil claim, we can help. Contact us to schedule a consultation today.